In order to give you the best and fastest Blu-ray/DVD ripping or conversion experience, Aunsoft upgraded the first and powerful Blu-ray Ripper with NVIDIA® CUDATM technology. 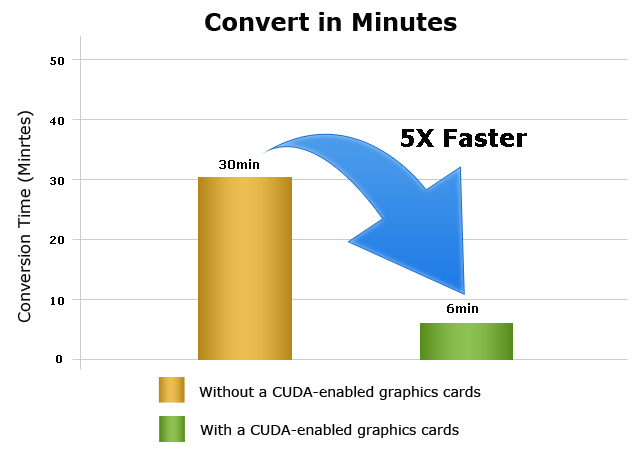 That means you can get up to 5X faster Blu-ray/DVD decoding/encoding speed on any computer with a CUDA-enabled graphics card. So just in a short time, you can let your Blu-ray/DVD movie to HD H.264 conversion done with perfect quality for smoothly playback or editing on PC. The operating principle of NVIDIA® CUDATM technology in Aunsoft Blu-ray Ripper is to process Blu-ray/DVD ripping onNVIDIA's GPU instead of your computer's CPU, so more CPU resources can be available for other applications, making your computer run much smoother than ever. You can see which conversion profiles in the program that leverage CUDA technology and GPU conversion acceleration in the program will automatically enabled once CUDA-enabled graphics card has been detected. The following chart shows the performance while ripping/converting Blu-ray/DVD with and without NVIDIA CUDA by using the Aunsoft Blu-ray Ripper. And the results are given in minutes. Want to get better performance of your Graphics Card, please download the lastest driver from NVIDIA Official Site.